I believe one of the best ways for an entrepreneur to increase the odds of success is to start projects by picking a market. In this article I want to examine why picking a market is important and examine a research technique that you can use. Over the years I have built a lot of personal projects. A few have found customers… many have not. I know I’m not alone in this experience. Medium, Indie Hackers and Reddit are filled with posts about engineers spending years working on product ideas that never end up finding viable markets. I have come to believe that a common problem entrepreneurs face is that they don’t know how to find viable markets. I want to show you the tools I’ve been using to do this, but first it’s important to understand why starting a project by finding a market is so valuable. What is a market and why pick one? What is a market and why pick one? — is a great question. As someone who has spent my whole career building products (instead of promoting them) I personally have had a very hard time understanding what a “market” actually is and how it is related to a “product”. A market represents a “problem space” defined by a certain set of customer problems and those customers’ available solutions. You can measure a market by looking at the markets’ demand, size, phase of life, growth rate and competition. There are books written on these measures if you want to learn more about them. If you want to learn more about market theory and market lifecycles I recommend reading Crossing the Chasm. If you want to see a practical example of how market theory can help you find early customers check out Justin Wilcox’s blog post on finding early adopters. Understanding these measures can give you an idea of the markets’ fertility and help you identify market holes and entry strategies. Measuring markets is a skill and requires research. I have to admit that in most of my past projects I have skipped this research. I had a product idea, had the skills to build it and wanted to swing into action. I think that’s how a lot of maker-entrepreneurs approach projects. Where do most entrepreneurs start when they want to build a new business? I have observed that many maker entrepreneurs — people from product backgrounds — start businesses by focusing on a particular product (market solution) without giving much thought to the market the solution will fit into. In contrast many marketer entrepreneurs — people who come from a marketing or business background — start businesses by picking a market… and then finding products for that market. Which approach is better? At this point I would learn towards market approach. What happens when you pick a product idea and wait to learn about the market until you’ve finished building your product? You risk building a product the market doesn’t want. All these reasons are market issues… something about the solution didn’t fit something about the market. The point is that the market is the environment you will be launching your product into and not understanding it leaves a lot of variables to chance. What is an alternative approach? What happens when you start your business by picking a market? Let’s look at a concrete example shall we? Bloggers do this. A blogger picks a broad topic (market)… and then every few days ends up releasing a new article (small product / solution) into that market. A blogger doesn’t start with a particular product idea because they aren’t addressing a specific problem. Instead their business aims to day-by-day address different related problems that a particular audience has. What are the advantages bloggers gain from their approach? 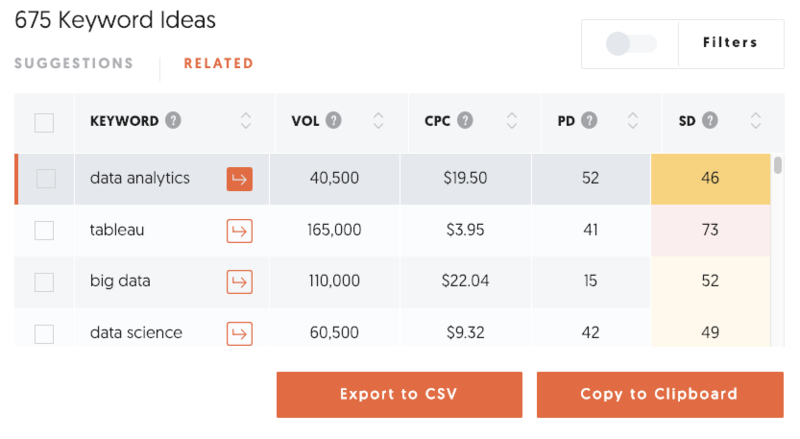 Many bloggers end up eventually launching paid products… but they make these bigger investments after they have familiarized themselves with a market. I personally think this is a reasonable more lower-risk strategy to pursue. The reduced risk comes because a blogger picks a market instead of a specific idea as a starting place. If you want to learn more about this approach I recommend reading Brennan Dunn’s posts on building a product by starting with consulting. I have found that when coming from an engineering background it’s easy to think that you have to solve problems by writing software but Brennan does a good job of explaining why it’s often better to start with simpler products. I don’t want to imply that I think these two strategies are the only paths to success. If you really want to build a specific product do it! Sometimes you just want to build something and I can 100% respect that. All I’m saying is that a little bit of market research can be really helpful. Give it a try. What have you got to lose? #1 is something you have to come up with myself… but the rest of the criteria can be researched. I’m still learning about markets and market research myself. I have found these ideas useful but I don’t claim that they are the *right* way to proceed… your milage may vary. In this part of the blog post my goal is to quickly find a viable broad market. This research represents a starting point. After doing this research I’d still need to narrow my market down until I’m addressing individual problems before I could build a product… but that is not the purpose of this step. The category I’m interested in is market research. The reason I chose this category is because my background is in engineering and data analysis and I enjoy looking at numbers and data puzzles. As I’m writing this I’m honestly not sure what the market for market research looks like. Which customers buy market research solutions? I don’t know. Who are the competitors? I don’t have a clue. The tool I’m using to do my research is UberSuggest. My sense is that this market is so-so. 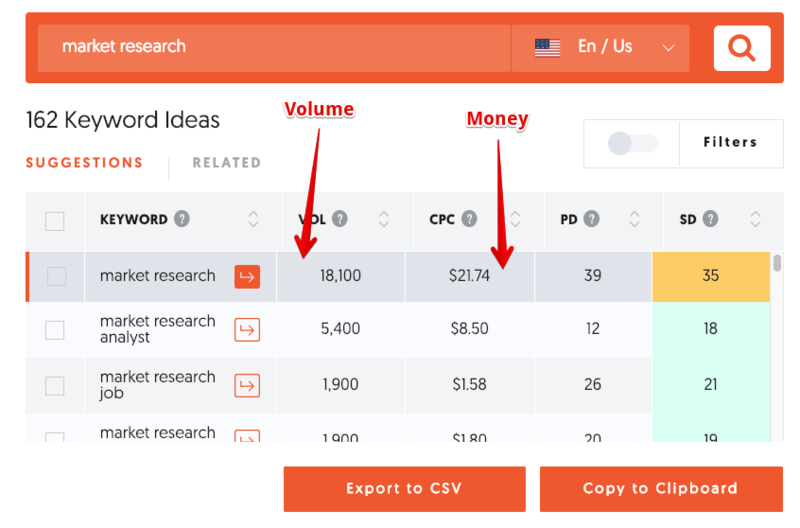 The search volume isn’t that high and advertisers aren’t bidding a ton of money on most of the related keywords. When I look at the search results my sense is that most search results are education. Competitors aren’t making much money so if I build a product in this category I may have a hard time making money too. Market research doesn’t seem very commercial but a related term, business intelligence, looks much better. The search volume for the business intelligence category looks very high. More importantly advertisers are bidding a lot of money on all the related terms. When I look at the search results that a google search returns lots of software tools are present. My sense is that this space is much more commercial. Possibly a good market for further exploration. I wanted one other option so I also looked at data analytics. Data analytics also seems like a reasonable potential market. 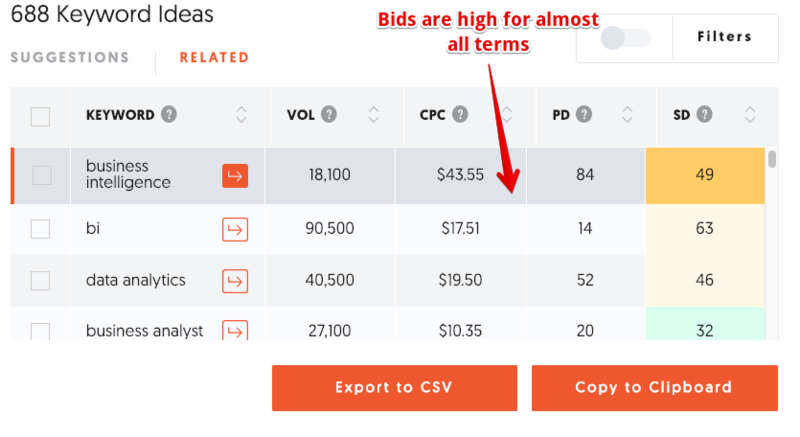 The term itself has fairly good search volume and companies are bidding on related terms. This search volume information is interesting but we need to see how these markets are growing. It’s easier to build a business in a growing market. It’s very hard to build a business in a shrinking market. Understanding market growth trends is important. To look at growth trends I can use Google Trends. It seems that the “business intelligence” market is heating up. The “market research” market is cooling and the “data analytics” market isn’t really going yet. If I intend to build new products, ideas that fall within the “business intelligence” niche will be easiest to market and grow. That’s the technique. It’s the starting point for finding a specific product idea. Next steps would be to start looking for smaller markets within the broader business intelligence market. We’ll save that one for some other time. I hope you understand why it’s valuable to pick a market. I hope you found the broad market research technique simple and useful.